This is a model of the Torre de las Infantas, in the Alhambra. 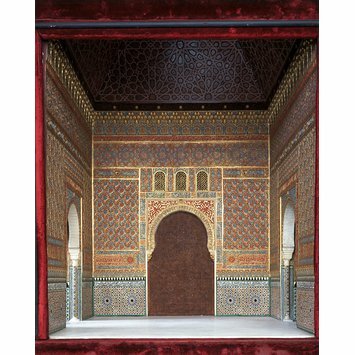 The outer walls of the model (made around 1890) are covered with a deep red velvet fabric. The interior is made up of geometric floral and vegetal designs that are brightly coloured with blues, reds. golds and greens. Leslie, Fiona. 'Inside Outside: Changing Attitudes towards Architectural Models in the Museums at South Kensington.' Architectural History 47, 2004, pp.159-200. The palace complex of the Alhambra is the great architectural achievement of the Nasrid dynasty. Its interiors are decorated with richly patterned tiles, painted plaster and carved wood. 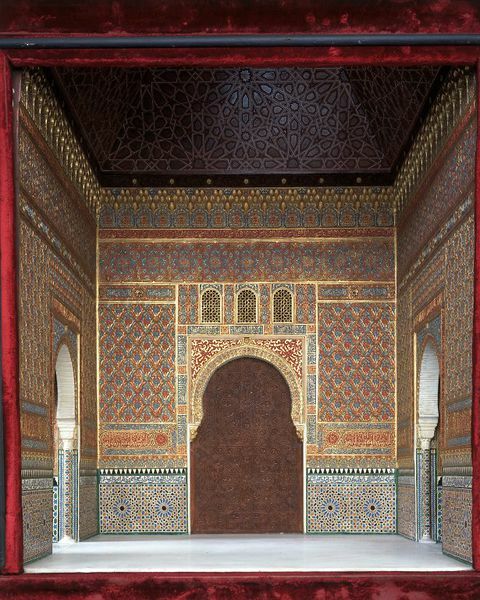 This room also bears a poem in Arabic describing the beauties of the interior. The room is in a tower called the Qalahurra Nueva of Yusuf I. With its walls and roof entirely covered with dense and varied ornament, it is typical of the Alhambra. Small windows in bays keep the room cool but allow views out to the surrounding hills.